As you all know I have been out of commission after undergoing surgery in January. Luckily I'm 92% healed which means I'm ready to party. Last weekend I was finally ready to participate in all of the activities! Our favorite way to kickoff the weekend is with a Winter Warmer. We stopped into an oldie but a goodie, Harry's Country Club. We had intended to make two stops but Harry's happy hour sucked us in. They even gave us a fancy Reserved sign, ahem VIP. After the happy hour we moved onto the Winter Warmers. Harry's featured Jack Handey and Hot Buttered Rum cocktails. The Jack Handey was crafted for those deep thoughts this time of year, the name was clever but the cocktail was lacking in flavor. Oh well onto the next, The Hot Buttered Rum was really tasty. Would have hit the spot if it had not been 60 degrees in February. We are not complaining though! Saturday we headed to the Madrid Theatre for Brunched, a Boozy Breakfast Event hosted by The Pitch. We signed up about a month prior to the big day so the anticipation was killing us. Luckily we paid the extra cash to get VIP tickets, why wouldn't we? We brunched like we've never brunched before! This brunch heaven showcased our favorite local brunch spots in one place. We even tried several new selections we had not ventured to yet. 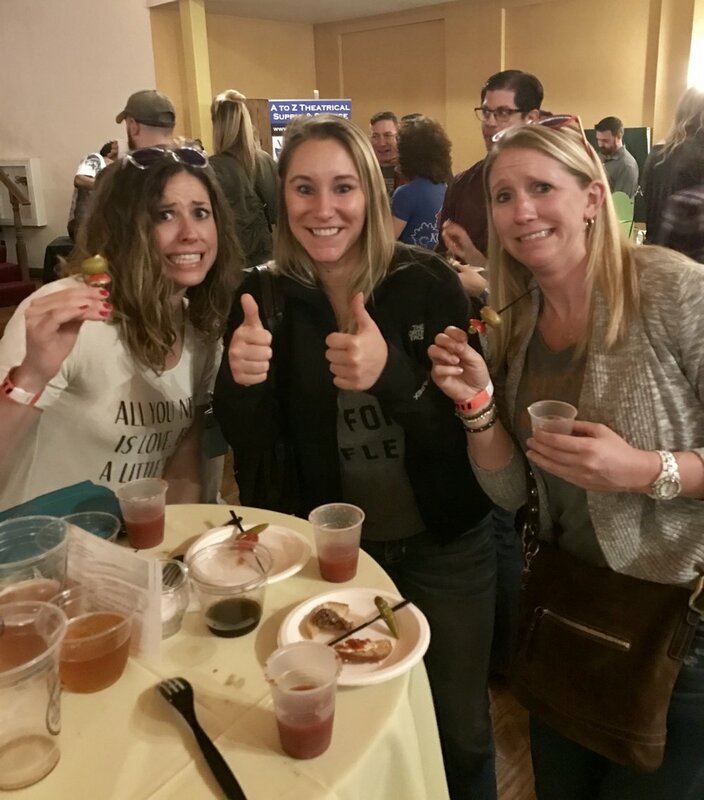 We feasted on brunch samples galore from area restaurants including Pinstripes, The District Pour House, Blip Roasters, Chez Elle, Morning Day Cafe, Brown & Loe, Schlafly Beer, Seasons 52 & many more! Our favorite brunch item was the banana's foster waffle, I believe the group feedback was to "Run, don't walk to the waffles". In addition to the fantastic food there was also a Bloody Mary Competition! According to The Pitch over 3,200 bloody marys were served in about 3 hours. Impressive. Bloody Mary's and olives for all...well for Steph at least. The 3 finalists from left to right: the District served a pineapple jalapeño Bloody Mary that balanced sweet and savory flavors. Trago had the garnishings on point, the goat cheese stuffed tomato was both genius and delicious. Morning Day Cafe nailed the fresh tasting ingredients without tasting like dirt, well done. The winner goes to The District! We couldn't have agreed more. Kristi and Leslie headed out to KC Bier Co to spend some quality time with Miss Barley and celebrate the breweries 3rd anniversary. Who doesn't love a pup friendly bar? Perfect way to end their Saturday afternoon. Aren't these two the cutest? Try the medium bodied Dunkel next time you go to KC Bier Co and let us know what you think! Sunday we went to Pinot's Palette to support Girls on the Run. Leslie volunteers as a coach for GOTR so we try to help support them any chance we get. The painting was the most detailed painting I have ever attempted. Thank goodness for the wine, it really gave me the confidence to create the masterpiece pictured below. High five. My first weekend back to adventuring was full of laughs, bloody marys and charity work. I am still recovering but I am ready to do it again next weekend!